Author Cheryl Strayed spoke to a packed house during a Chicago Humanities Festival event Wednesday, and shared a story about how a phone call from Oprah Winfrey changed her life. STREETERVILLE — Addressing a packed house during a Chicago Humanities Festival event Wednesday, author Cheryl Strayed shared a story about how a phone call from Chicago changed her life. When Strayed released "Wild" in 2012, she said she was thrilled the story of her 1,100-mile Pacific Crest Trail hike reached the New York Times best-seller list. Then she got a call that made the book even bigger. Strayed said she was in a Milwaukee motel room when she saw a "Chicago number" pop up on her phone. Thinking it was a local bookseller, she answered "This is Cheryl." "This is Oprah," the voice on the other line said in a voice Strayed recognized immediately. "Maybe I should restart my book club for the book," Oprah Winfrey said after the two discussed the Portland-based writer's memoir. "I think that sounds good," Strayed responded, eliciting laughter from the audience. Winfrey ended up restarting her book club for "Wild," but Strayed had to keep the huge news a secret from almost everyone in her life until Winfrey was ready to make it all official. She also had to stay mum about her visit to the Chicago talk show legend's home. In a July 2012 issue of her magazine, Winfrey discussed her decision to restart the book club for "Wild." 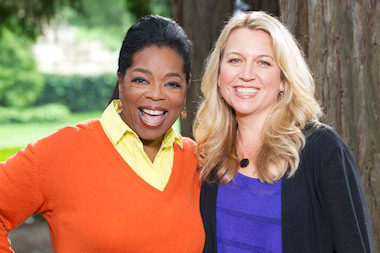 "I read Cheryl Strayed's memoir, 'Wild,' on my Kindle, on my iPad — and in hardcover, too," Winfrey wrote. "I love this book. I want to shout it from the mountaintop. I want to shout it from the Web. In fact, I love this book so much and want to talk about it so much, I knew I had to reinvent my book club." Strayed got a similar call months later from Reese Witherspoon, who plays Strayed in a film adaptation of the book coming out Dec. 5. She said the film had a small budget compared to a typical Witherspoon blockbuster, because she wanted to stay true to the book — and to Strayed's character. The two feared a Hollywood executive asking, "Does she have to say f**k so often?" Strayed said. For more on the Chicago Humanities Festival, check out our guide here.